Nothing is more important to a hammock’s function than its ability to safely and securely attach to a tree or post. Our selection of hammock accessories ensures that you have all the right equipment to set up your hammock wherever you prefer. If you want to set up your hammock away from trees and posts, we have hammock stands that are easy to position in any location. We also have hammock straps that fasten your hammock tightly to a tree. Don’t forget, all of our hammock accessories, like every product we sell, come with a 30-day 100% money-back guarantee, so you can buy with confidence. 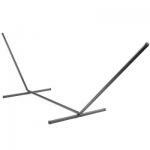 Hammock stand is sturdy and adjustable. Nice color. It does rust in the morning dew. Product arrived in boxes wrapped in bubble wrap & aside from a few minor scuffs in the paint it was in very good condition. The stand was easy to assemble and was made very well. The tubing was heavier than I expected and should hold up for years. The only suggestion that I have is to include the distance between the welded on hangers for the swing to hang from in the product description on the website. I used mine for a 4 foot poly swing. No problems with this stand. It's sturdy and the green color blends into the trees and bushes behind... However, the rope hammock was too short for the stand. Even though it was ordered from the same company. We gave the rope hammock away and bought a lovely hammock from Pelican Bay, that fits. I got this for our new home, and was hoping that it wouldn't be tacky in the nice neighborhood we live in now. It looks great, and is holding up outstandingly to our use! No warping at all in the hot CA sun! 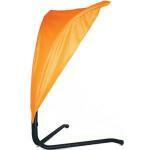 Its really nice because I can move it easily under the shade tree, or leave it on the patio for some sun. I bought the hammock chair and stand for my wife for Christmas. She loves the chair! She can sit in the chair for hours and remain extremely comfortable. She is extremely glad that this new addition was added to our backyard. The chair is light enough that she can hang it up while used and then take it down and put it inside when done to protect it from the elements. Great free standing hammock stand! This was the lowest priced stand that I could find on the internet and is such a good value! Works great! It is Wonderful! The quality is exceptional and not flimsy at all. I would definitely recommend this stand if you want quality and style. This is a great stand! My mother wanted to use her hammock chair inside the house and the stand has a small base. So it doesn't take up a lot of room if you have a large room with tall ceilings because even though the base is small the stand is still large. It will work great on the deck outside in the summer.